Creating a new civilization : the politics of the Third Wave · One Book. One Author. One Hour. Notes on front end paper: p. 55 Proletariat becomes a cognitariat. How much do you use a computer. Underlinings/Notes: Underlinings: Family structure frayed, mass media de-massified, values diversified--old terms like right/left-wing, liberal/conservative drained of meaning. Book new framework for change. Pace. DeTocqueville. Lamb underlines passages relating to Toffler's friendship with Newt Gingrich. "Third Wave" information-age society--transformation in human affairs. First Wave--agricultural revolution-thousands of years to play out; Second Wave--rise of industrial civilization-300 years; Third Wave--few decades. No future. Final generation of an old civilization, first generation of a new one." Details on the spans of each wave. References to Paul Kennedy, Francis Fukuyama. Tensions between older forms of civilization--Third Wave. Upheaval in society's knowledge base. Electronic pathways form essential infrastructure of the Third Wave economy. Unions will need to support work-at-home programs, flextime/job-sharing. Marxist theoreticians stuck in Second Wave past. Most important form of property intangible, super-symbolic it is knowledge. Third Wave companies--young corporate age/workers; invest in research and development, training/education, human resources. Congress--representatives know less and less about measures on which they must decide--rely on judgment of others. Notes: "Gingrich sense of humor," "Democrats called after election," "Iraq," "Future Wars," "Worst bloodshed in coming years," "Power shift '90," "Capital formation less is needed," "War and antiwar 1993," "Powershift '90," "Toffler Reagan meeting," "Powershift 90," "Moscow's downfall," "Bored and angry at the media & politicians," "Lee Atwater," "TV," "debate needed on new political system." 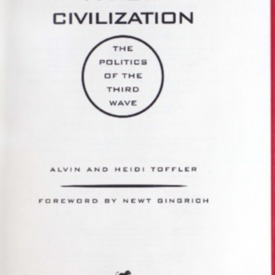 Toffler, Alvin, “Creating a new civilization : the politics of the Third Wave,” One Book. One Author. One Hour., accessed April 19, 2019, http://booknotes.gmu.edu/items/show/299.